The M&M 2016 Submission Site is CLOSED. Please note: The two-page scientific paper format is REQUIRED. Additional instructions and templates are available at the green links below. SUBMISSION DEADLINE was February 16, 2016. Post-Deadline Poster slots are available. CLICK HERE for more information. Computers are NOT provided for your presentation. You must bring or arrange for your own computer for your presentation. Both Mac and PC formats are supported. The default ratio for projectors at M&M 2016 is 16:9 (high definition). Please plan your slides accordingly. A 4:3 ratio will work; however, there will be black vertical bars on either side of your projected image. Both HDMI and VGA cables will be provided. We recommend HDMI for HD projectors. If you don't have a computer to bring, ask your symposium organizer or session chair if you can use another presenter's machine. If you bring a computer, please make sure that you have administrative access and know the password. If possible, we suggest bringing your presentation on a flash drive and/or storing it online so that you have access to it in case your computer has technical problems. Please note — morning symposia will begin at 8:30 am and 10:30 am, and afternoon symposia will begin at 1:30 pm and (Thursday only) 3:30 pm. If you wish to preview your presentation, an area is available in the Speaker Ready Room in the Columbus Convention Center (room TBD). Poster Presentations are scheduled for Monday, Tuesday, Wednesday & Thursday, July 25-28, Exhibit Hall CD, Columbus Convention Center. All regular poster presentation notifications will be sent on or before May 1, 2016. Papers will be assigned by the Program Committee to either a Platform or Poster presentation, unless "Prefer Poster" is selected in the online paper submission site. Authors will be notified of their assignment by May 1, 2016. Poster assignments will specify a presentation day; however, all posters are required to be displayed for the duration of the meeting. All posters will be displayed Monday morning through Thursday 12:00 Noon. 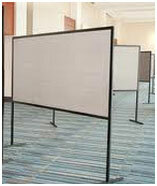 Poster presenters must remain at their poster on their assigned day during the required hours. Each poster will be allocated a 90" wide x 45" high display area. Authors must provide their own male velcro hooks or push pins for mounting. A (suggested) 8-12-in. high strip at the top of your poster should contain the title of the paper and the name and affiliation of the author(s). The poster should have large legible text and figures, and describe the results in a manner that would be clear to a reader in the author's absence. Stereo images may be mounted and presented for stereo viewing using viewers provided by the author. Authors with videotape data are strongly advised to seek a platform presentation. MSA does not permit any type of recording (photography, video, audio, etc.) of lectures, posters, tutorials, workshops and commercial exhibits at the Microscopy & Microanalysis meeting without prior permission of MSA or the individuals concerned. The published proceedings for the M&M meeting are 2-page scientific papers (required of all presenters) which are reviewed for content, format and appropriateness. These are able to be referenced, and are published by Cambridge University Press under the meeting's moniker. This is in marked contrast to other meetings which distribute ABSTRACTS (and only to attendees), the results of which are never heard from again. Key scientific "firsts" are routinely reported in the M&M Proceedings. We highlight new and innovative as well as informational/tutorial/help work. You will be able to find electronic copies of our papers online using the standard publisher DOI; referencing system and requests are routinely found for copies of our short papers. This compendium of work and material with full access is not duplicated anywhere else in the world, and that is why the M&M Annual Meeting is so popular, and why its standards exceed all others. If there are presentations that need to be cited in published work, MSA releases the copyright (free) for publication of images used in the meeting's Proceedings papers with no problems. The Proceedings papers are published on digital media, online on the Microscopy and Microanalysis (Cambridge University Press) homepage as Supplement 3 to the MAM Journal, and as a hardbound Print-on-Demand option. Most Proceedings papers are on the Web of Science. Medlines usually does not reference the Proceedings papers.